I made the mistake of shaving my dog years ago, and it’s something I’ll always regret. I figured shaving him for the summer would be an easy way to help keep him cool when we were out, but that didn’t happen. It just made everything worse. After that shave he was even less tolerant of the heat, and ten years later his coat still hadn’t recovered. His once sleek, beautiful, shiny coat became a coarse, frizzy mess that took hours to manage. His coat was permanently damaged by shaving, and he had to endure those horrible grooming sessions for the rest of his life. Shaving your dog for the summer may sound like a good idea, but it doesn’t always turn out that way. I wrote this article to share my own experience, and to prevent others from making the same mistake I did. Have you ever considered shaving your dog for the summer? I shaved my dog years ago under the assumption that it would help keep him cool, but unfortunately it had the opposite effect. What I didn’t know then was that the kind of coat your dog is what determines whether or not they should be shaved. Before you decide to shave your dog this summer please remember this: double coated dogs should not be shaved. Shaving a double coated dog will not help keep him cool, it will just make things worse. Single coated breeds (such as Poodles) can have their fur clipped or shaved down to the skin and it will grow back the way it was, but that’s not the case for double coated breeds. Before you decide to shave your dog this summer please read this article first. I shaved my dog years ago, and it’s a mistake I’ll never forget. Not all dogs should be shaved, and I learned that the hard way. When deciding whether or not to shave your dog you need to determine what kind of coat your dog has — single or double. Double coated breeds are those that have two layers of fur. The top layer is made of tough guard hairs and the bottom layer is a thick layer of fur called an undercoat. The undercoat is a layer of fine hairs close to an animals skin that help keep them cool in the summer and warm in winter. In the spring they go through a major shedding period known as blowing their coat when much of that undercoat is released to make way for their lighter summer coat. 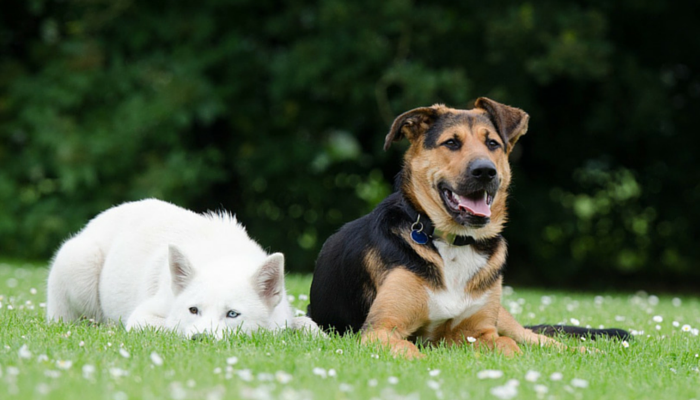 Common double coated breeds include Huskies, Chows, Labradors, German Shepherds, Golden Retrievers, and Pomeranian’s. 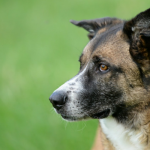 Most of the herding breeds have a double coat, as well as the Spitz type breeds and a majority of Terriers. Shaving a double coated dog can permanently damage their fur, and contrary to popular belief it does not help keep them cool in the summer. Shaving a double coated dog should only be done in extreme cases of matting or with certain skin conditions. I made the mistake of shaving my dog Carter when I was younger. 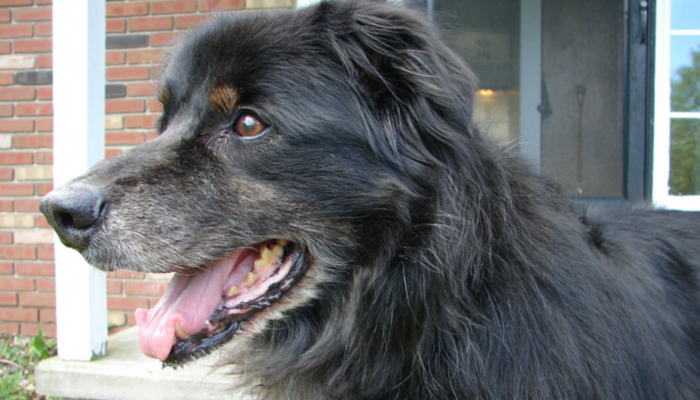 He was an Aussie mix that had a thick black double coat that was beautiful and shiny. I thought I could help keep him cool by getting rid of all that extra thick fur in the summer. Makes sense right? Would you want to carry around a thick coat like that in the summer? So I went to my local groomer and had him shaved — no questions asked. He was three when I had him shaved. When he passed away 10 years later his top coat still hadn’t returned. He was left with a thick, unruly coat that became hard to manage. The hair on his back thighs, stomach, and chest were constantly matted after that shave. Turns out an undercoat left uninhibited isn’t easy to manage at all. And to my disappointment it didn’t help him cool off in the summer at all, it actually made it worse. He began taking a lot more breaks during our walks and he started panting heavier than usual. Looking at him I knew I had made a huge mistake; I had made the summer more intolerable for him. So please, take it from me — think twice before shaving your double coated dog. Here’s 5 reasons why double coated dogs should not be shaved. The reason I shaved my dog was to help keep him cool in the summer. It didn’t, in fact it made him even less tolerant to the heat. Your dogs coat serves as a natural insulation from both hot and cold weather. The hot sun will warm your dog up more if they don’t have that layer of insulation protecting them. Shaving your double coated dog doesn’t help cool them down. Their top layer of fur acts as insulation that helps keep them cool in the summer and warm in the winter. 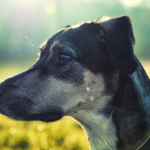 The top layer of your dogs fur helps protect them against bug bites and the suns harmful rays. By shaving your dog you’re leaving them more exposed to the sun, increasing their risk of developing sunburn or skin cancer. When a double coated dog is shaved there’s no guarantee the top guard coat will grow back. And the older a dog is the less likely it is to grow back normally. The undercoat continues to grow, but for some dogs the guard hairs never do. These dogs are left with a coat that has a patchy, frizzy, dull appearance. Shaving your dog can alter their coat permanently. This is what happened to my dog Carter. His backside, belly, and legs never grew any top hairs back. It became nearly impossible to groom him on my own. The undercoat became so wild, frizzy, and unruly that it felt just like harsh wool. After dealing with Carter’s damaged coat for 10 years I’ll never shave a double coated dog again. 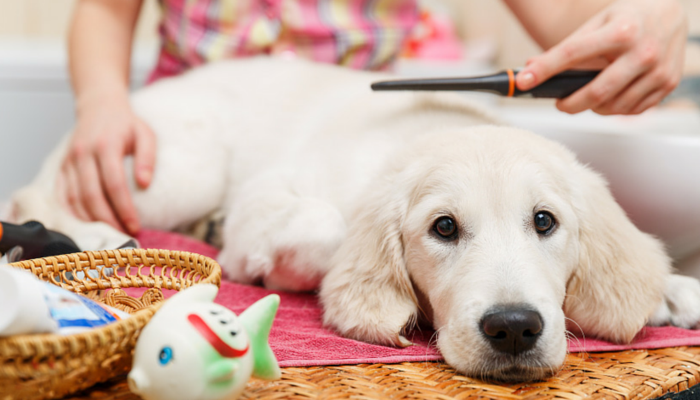 Will shaving your dog help with allergies? Not at all. 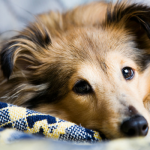 The dander on your pets skin and fur is what causes pet allergies, not the fur itself. And that dander is a collection of dead skin cells that sits in the undercoat of double coated dogs. So when you shave your dog you’re actually going to be exposing yourself to more irritants. Shaving your dog will allow more of these allergens to become airborne, leading to more chances for direct contact. Shaving your dog does not decrease shedding. Your dog will still shed, and after shaving it will just be shorter hair that they’re shedding. Because their top guard layer has been removed (the part that doesn’t shed), the undercoat is allowed to grow uninhibited which can lead to more shedding. Double coated breeds require regular grooming. In the spring and fall they go through their shedding process which can be a lot to handle if you’re not prepared. Hair will get everywhere – not just little bits and pieces either, huge tufts at a time will come out. Maintaining a regular grooming schedule for double coated dogs is necessary. You can get a de-shedding tool like the Furminator (which is great for my German Shepherd mix with short hair, but it may not be the best choice for some longer haired breeds since it can pull too much hair at one time), or you can take a trip to the groomer and let them do the heavy work. Regular brushing does more than just remove extra fur. It helps keep your dogs hair in good condition by removing dirt, preventing tangles, and keeping their skin clean and irritant free. 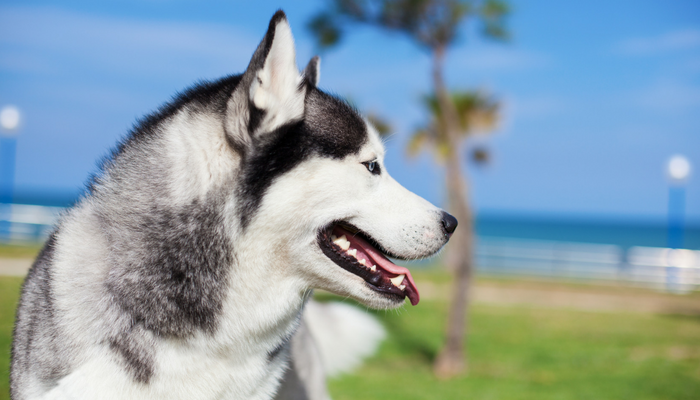 Regular grooming will cut down on shedding and help keep your dog cooler in the summer. Shaving a double coated dog does not help cool them down, it will not decrease shedding, it will not prevent allergies, and it permanently damages their coat. Shaving your dog in the summer seems like common sense, why wouldn’t it help keep them cool? That’s probably why I didn’t think twice before paying a groomer to shave my dog. But that one shave damaged his coat forever. His top coat never grew back, and as a result he had to endure long grooming sessions as I tried to keep his unruly wool like fur under control. It’s something I’ll always regret. Lots of us make this assumption about a nice summer shave for our pets. It’s so easy to do, and it’s hard to imagine that it could do any harm. But please think twice before shaving your dog, don’t make the same mistake I did. If you have a double coated breed remember that his outer layer of fur is there for a purpose. 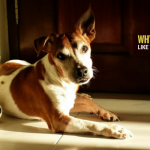 It serves as your dogs heating and cooling system, developed and designed by mother nature herself. Please think twice before shaving your dog – in this case nature knows best. Interesting article – chuck full of educational info about shaving your dog! I didn’t realize all of the good info in your posting – so thank you for sharing your knowledge! Thanks for stopping by – hopefully we will see less shaved dogs this summer. I wish I had read this years ago… I, too, though cutting my little Pomeranians fur would help him stay cooler when I was away in college. At first, his fur grew back and I didn’t think anything of it. After the second time, the groomer said if it didn’t grow back, I should stop grooming him without an explanation of why. Eventually his back didn’t grow back but everything else did. Now a few years later, I notice he’s always panting. I don’t know what I can do now to keep him cool other than the usual stuff: air conditioner, plenty of cool water, keeping temperatures down during the winter. Do you have any recommendations? Sounds like you’re doing all the right things to keep him cool. The only other suggestion I can think of would be to watch when you’re exercising or walking him; if he has a tendency to get too hot during the day you could stick to morning or evening walks/exercise to avoid the hottest parts of the day. Great helpful tips. My golden is one with a thin coat so I’ve never considered shaving him. My spaniel mix has an incredibly long, furry coat all the way down to her toes, but it is sleek and tangle-free and nice and I just keep her clipped. Some have suggested that she’d feel more comfortable in the summer if shaved. I think keeping it trimmed a little shorter in the summer is best for her. Trimming is a great way to help out – it’s surprising how many people suggest shaving dogs. Apart from for surgeries, we never ever shaved our dogs. I figure the nature gave them their coat for a reason. Glad to hear you confirm that it does nothing for cooling them down. Thanks for spreading the word about this! I will sometimes see shaved Norwegian Elkhounds, which makes me cringe. Our Maltese gets a buzzcut to help keep mats at bay, but we never shave our Pomeranian/Eskimo mix because she has a double coat. Our Puggle doesn’t go to the groomer, he just sheds at will. Luna just sheds, so she doesn’t go to the groomer for her coat (other than the occasional bath). So of course I had no idea about the consequences! Thanks for sharing. Having numerous long-haired dogs in the past, I knew most of this information against shaving dogs. Thank you for bringing it to public attention so well! I had read some of the same on Owned By a Husky. That is a tough way to learn. Cats have double coats but some of my furrends get shaved for mats. I only get shaved once at the vet. We groom our dog but we never shave him down for many of the reasons you mentioned here. TY for getting the word out! Oh wow, I had no idea shaving could end in such bad results! I have wondered what shaving might do, but I won’t even think about it now. You saved a lot of readers’ dogs from misery! Very interesting! It is amazing how nature has already taken care of many of our pets’ heating and cooling needs. I guess this is just one more reason to find a very knowledgeable groomer that will steer you in the right direction. As a groomer, I have had so many arguments with clients about shaving their double coated breeds. So many.. 🙁 I got to the point where unless the dog was a farm dog (incredibly matted and not able to brush) or had a medical problem I would not be shaving any double coated breeds. People didn’t like it and they’d either let me brush or they’d go somewhere else. A lot of people are just lazy and don’t want to deal with shedding. Thank you so much for commenting on this; I love hearing from you and especially knowing your background as a groomer. It makes me wonder how many groomers are willing to do a shave with no questions asked. No problem! Any time! 😀 I know SO many groomers who just take them and shave them no questions asked. It used to frustrate me so much. Especially when they’d check in my appointments and not say anything to the owner! Fantastic info! I know I’ve heard some of it before but this is probably the first time I’ve really seen it explained so thoroughly. Being a beagle mom I don’t really worry about this, but it’s good to know. I learned a lot from this article. I know folks who shave their dogs for the summer and I never did. Now I feel better about my decision. Yes! Thank you. I think it is so important that when you get a dog with a double coat one of the costs that you plan for is regular grooming. Our boys stay plenty cool with regular brushing, baths, and the heavy work from the groomer! Great post. I’m surprised that folks would still think about shaving dogs that aren’t meant to be groomed, but I guess they do. I keep Torrey trimmed in the summer. I do it myself, so I know it won’t be too short. She has a very thick under coat, and if her top coat keeps growing it is very long. Then it’s a hazard for her because every thing gets stuck, and down in there. I brush her daily, but it’s still hard to find weeds, or burrs that have worked their way down. Thankfully, I haven’t had huge issues with ticks. Great post! Thank you for sharing about this! This is a very misunderstood topic! Great post. I have tried to tell people all of this to no avail. Wow, I had heard of this but wasn’t really sure if it was true. My parents shave their springer spaniel, like a lot of spaniel owners do, and her coat always comes back nice because she doesn’t have a double coat. I used to work at a grooming facility. I only did baths and worked as the receptionist. The professional groomers there were very against shaving double coated dogs, but people asked to have their golden retrievers shaved all the time. It’s a really helpful article, though I have a very different problem. O have a golden retriever whose fur is very damaged by the sun etc and it is not managable anymore. Moreover the dog has many different skin conditions and is suffering from stuff that are caught on its fur. I’m not sure if I should shave it or not. Any tips please? I’d take a trip to the vet to find out exactly what skin conditions your dog has. Depending on those they’ll be able to better recommend whether shaving is a good idea or not, and what treatments you should try. (I know shaving can help with certain skin conditions) Best of luck to you. I’m a veterinarian, I have my website about horses and dogs. I often translate good articles from English into Russian (for example, Dog’s Natural Magazine allows me to translate their articles). Jen Gabbard, may I do it with your article? This may not be any of my business, but before you give permission for someone to put your article on their website, you might want to check it out before you do so. You may not want to be associated or look like you are endorsing their opinions, if you don’t agree with them. For all we know, their website could contain controversial, sexist or racist thoughts. I’m pretty much sure that this is not the case here, but you never know. There are a lot of crazies on the internet. Brilliant information. Bit of luck of the draw really though. I have a husky x retriever and clipping him was the best thing we ever did. He does have the long rockstar hair he used to but he loves swimmimg now (we think the hair weighed him down before). He is so much more active in summer it has made a huge difference with him but unfortunately you try to explain to people and you get backlash of how we shouldnt but they dont see the before and after. He is so much happier without the big coat now. Good post, I did made research and found out that it was a bad idea to shave a husky. Too bad I couldn’t convince my stubborn brother to not shave our husky. His coat is not the same as before. My brother had to make his own research to finally understand how bad it was to shave our husky. Thanks for this thoughtful article. I noticed that you’ve talked about the coat acting as “insulation from both hot and cold weather” I hate to be pedantic on the internet … but I’ll do it anyway. The “insulation from heat” idea may encourage the right behavior, but it’s for the wrong reasons. Later in the article, you explained that the coat protects from sunlight. That reflection is how the coat helps prevent overheating – not by insulating. For keeping cool, perhaps a roof or canopy is a more apt analogy than insulation. Regardless, thank you for encouraging responsible pet ownership. That’s so sad ????. I’m so sorry you experienced that ! Rest in paradise Carter until we get there! You are still so very loved ❤️! We have shaved our Aussie Sheps for years (1xper year) with no skin issues. Their coats have not changed, and as a previous comment stated our pups are so much happier once shaved. They run and frollock in the fields and seem excited for all of that hair to be gone. We live in TN where the heat and humidity can be overwhelming for pets and I have seen double coated dogs suffer terribly and lay around on cool concrete until coats are trimmed. That being said, it doesnt mean everyones experience is going to be the same from state to state. What do you think about only shortening my dog’s hair? He’s a young Border Collie with a medium dense hair, about 10cm long. I’m thinking of cutting his hair only for like 5cm. As far as regulating temperature goes the most important aspect would be ensuring that the bottom coat/undercoat aka the guard hairs aren’t directly exposed to the elements, and that the outercoat is still long enough to cover it and keep it protected. Generally just cutting or trimming the outercoat itself doesn’t do any damage. If you’re not sure what length to go with I’d reach out to a local groomer and let them know your concerns. I’m not familiar enough with smooth versus rough Border Collie coats to give a definite answer as to an appropriate length. If your dog’s coat is similar to an Australian Shepherd’s (medium length with a double coat) I can say to be careful around the sides because some of the outer hairs are pretty short (especially towards the top). Hi, love the article. Just wondering, what breed of dog is the white dog under the header “There Are Better Ways to Manage Your Dogs Coat”? Thanks, the dog in that picture is a Golden Retriever mix. My goldendoodle had long straight/wavy hair. We had to switch groomers and when he got some mats she said he’d have to be shaved. I expressed that we did not want him shaved all over and decided to work on the mats myself. We spent hours over a month so as not to hurt him. Told her again that we did not want everything shaved to “start all over”. My husband picked him up and she went down to near skin anyway. He’s skittish, itcy and miserable. The damage is done. Now what do I do???? Can you recommend anything to help his skin and how long will it take to grow back??? I’m crushed. I wish I could’ve read this earlier. When my parents got our first dog we didn’t know anything about double coated dogs. Heck, we didn’t know that was a term. So every year for about eight or nine years now we’ve been shaving our Samoyed husky mix’s fur in the summer and his coat looks very sad. We brush it regularly to keep him looking nice but it doesn’t do much because it’s already so damaged. Is there anything I could do to improve his coat from now on?